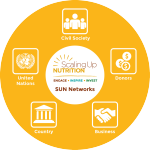 On 1st June 2015, the SUN Movement Secretariat chaired the monthly conference call of the SUN Network Facilitators. This meeting provided the facilitators an update on progress towards the development of the SUN Movement Strategy 2016 – 2020. It was noted that a Transitional Stewardship Team (TST) had been put in place to oversee the recruitment of a new SUN Movement Coordinator and to make arrangements for an Executive Committee that will strengthen the oversight and functioning of the SUN Movement Lead Group. Updates were also given on the launch of the SUN Movement MPTF Evaluation and the process for preparing the 2015 SUN Movement Annual Progress Report.